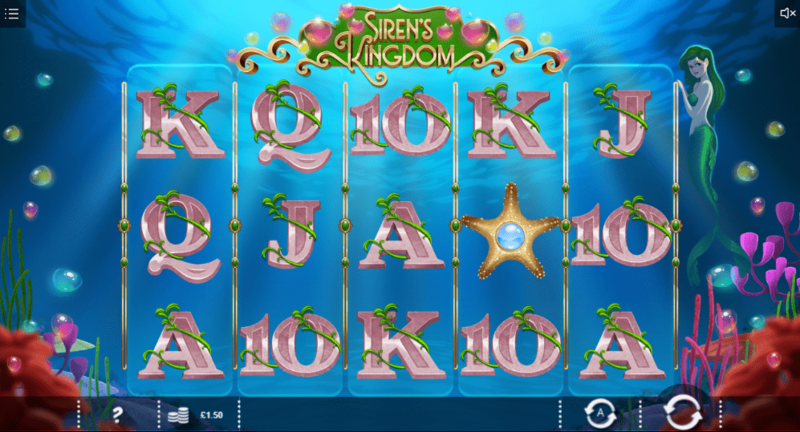 5 reels and 30 pay lines are what you have to work with here in this online video slot game that is set underwater in Siren’s Kingdom. 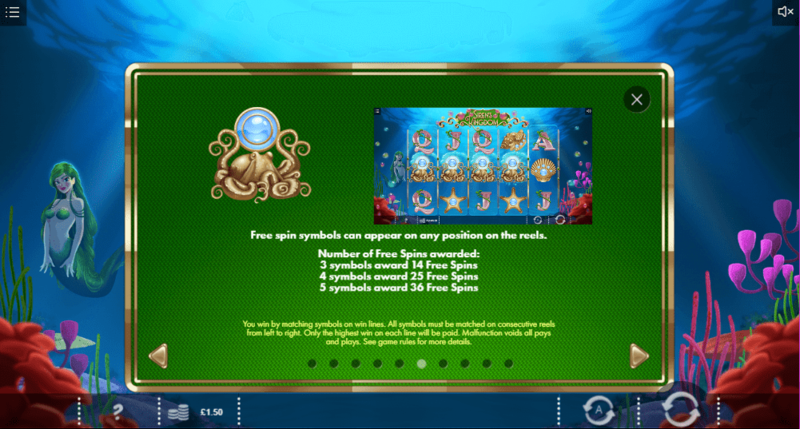 You join a mystical mermaid under the sea in this entertaining slot, that packs wilds and free spins into the fun. Playable across all your usual platforms, this is a very enjoyable slot, indeed. The developer, Iron Dog, has many more amazing slots casino. Iron Dog Studios are the developers of Siren’s Kingdom and they have undoubtedly done well to create what is a simple, but very fun and very good-looking slot game. Animations are impeccable in this title with the gentle waves of the ocean creating quite a tranquil slot game experience. The wilds feature is a very useful one and all in all, bonus features are kept simple but effective, with the free spins offering a familiar feature. Iron Dog is a fairly new name on the online slot game scene but is doing well to enhance their growing reputation with games like this, Moirai Blaze and Rainbow Wilds. For more exciting fun, have a test play our slots games on our site. The theme of this slot is a mix of fantasy and underwater, as our mermaid protagonist takes the lead role here. Showing you around Siren’s Kingdom, you will notice the impressive graphics that this slot game displays. There are some more slots with great graphics you can play, Visit this guide and try the top 10 best slots in that category! Animations are smooth and you like, flowing like water itself, whilst reels are made, symbols detailed and the backdrop is visually pleasing as well. The ocean floor is the setting, with bubbles, coral and seaweed decorating the deep blue. Bubbles are multicoloured and come in purples, pinks and greens, adding some variety and vibrancy to a game that could have easily been quite dark, what with the ocean bed setting. As for the symbols, they all have a sea theme. Playing card symbols of between A and 10 have undersea plantations wrapping themselves around them. These act as the lower paying symbols in Siren’s Kingdom and as you’d expect, their value is represented by their value as a card, with A being the best of them. As for the higher payers, seashells, clam shells and starfish come into play. All made of a golden sandy colour, the best of them will pay up to 13.33 times your stake should you land 5 of them on the same pay line. As for the wild, this is represented by the red-haired siren, the mermaid. Whenever a mermaid wild lands, it fills the entire row and she will also substitute for any other symbols apart from the scatter. Landing multiple sirens on one spin will lead to a rewarding multiple wilds. The scatter symbol is the integral to the main feature here and is represented by an octopus holding a pearl. This will reward free spins should you land at least 3 of them, with up to 36 free spins available if you land 5. Can't get enough of playing Siren's Kingdom? Give Gifts Of Ostara a try today! Siren’s Kingdom is a strong online slot game for it’s quality of graphics and it’s simplicity. It has enough bonus features to keep things fresh without getting overwhelming or confusing. The narrative is good and as mentioned, the strong graphics help carry off the theme well.